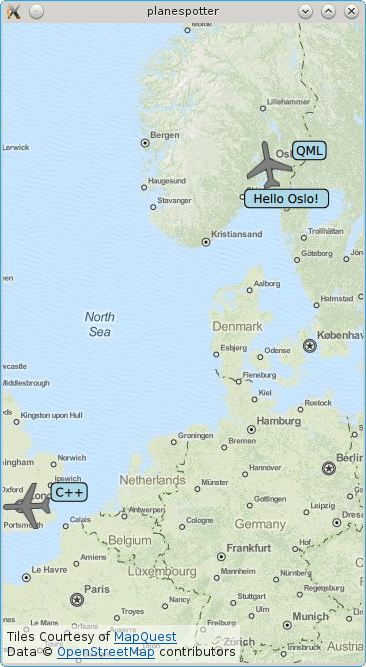 The Plane Spotter example demonstrates how to integrate location and positioning related C++ data types into QML and vice versa. This is useful when it is desirable to run CPU intensive position calculations in native environments but the results are supposed to be displayed using QML. The example shows a map of Europe and airplanes on two routes across Europe. The first airplane commutes between Oslo and Berlin and the second airplane commutes between London and Berlin. The position tracking of each airplane is implemented in C++. The Oslo-Berlin plane is piloted in QML and the London-Berlin plane is commanded by a C++ pilot. This example makes use of the Q_GADGET feature as part of its position controller implementation. It permits direct integration of non-QObject based C++ value types into QML. The main purpose of the PlaneController class is to track the current coordinates of the plane at a given time. It exposes the position via its position property. Similar to QObject derived classes, QGeoCoordinate can be integrated without an additional QML wrapper. As mentioned above, the primary purpose of PlaneController class is to track the current positions of the two planes (Oslo-Berlin and London-Berlin) and advertise them as a property to the QML layer. Its secondary purpose is to set and progress a plane along a given flight path. In a sense it can act as a pilot. This is very much like CoordinateAnimation which can animate the transition from one geo coordinate to another. This example demonstrates how the PlaneController's position property is modified by C++ code using the PlaneController's own piloting abilities and by QML code using CoordinateAnimation as pilot. The Oslo-Berlin plane is animated using QML code and the London-Berlin plane is animated using C++ code. No matter which pilot is used, the results to the pilot's actions are visible in C++ and QML and thus the example demonstrates unhindered and direct exchange of position data through the C++/QML boundary. The pilot employs a QBasicTimer and QTimerEvents to constantly update the position. During each timer iteration PlaneController::updatePosition() is called and a new position calculated. Once the new position is calculated, setPosition() is called and the subsequent change notification of the property pushes the new position to the QML layer. First, NumberAnimation rotates the plane into the correct direction and once that is done the startFlight() function takes care of starting the plane's position change. The CoordinateAnimation type is used to control the flight from Oslo to Berlin and vice versa. It replaces the above ScriptAction. The MouseArea of the QML plane implements the logic for the course setting and starts the animation when required.